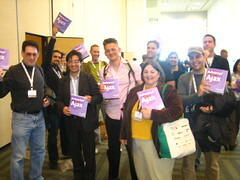 I remember when Ajax started gaining traction on the web and in the minds of developers. One of the factors that web developers suddenly had to think about was giving feedback to the user when a request was made to the server. And so web developers everywhere began to recreate loading indicators that were so popular on Flash sites. Some of them are very clever, created entirely in CSS. This is a pattern that has been codified into HTML itself. We now have a progress element. This can be used to display fine-grained progress if you give it value and max attributes, or you can simply use it without any attributes to indicate that something is happening …perfect for those Ajax requests. Modern browsers show the native progress indicator. Older browsers show the animated .gif. That’s the core information for that page, preceded by a header with site navigation and followed by a footer with some additional links. my latest updates on Twitter. links to share and embed the audio. In both cases, this supporting information isn’t essential; it’s just nice to have. There’s a potential performance problem though. Because this extra information is coming from third-party services—and despite the fact that I’m doing some caching—it could delay the display of the whole page. So I took some time on the weekend to adjust the architecture a little bit. Now the extra information is requested with Ajax once the core information has already loaded. This is lazy loading. So if you load my profile on a small screen, you won’t see my latest tweets or my Last.fm recommendations. Likewise if you look at something I’ve huffduffed that’s tagged with music:artist=radiohead you won’t see information from Last.fm, pictures from Flickr or albums on Amazon unless you load the page with a wide enough viewport. Now it could be that the real issue here isn’t viewport size, but connection speed …in which case I’m making the classic error of conflating small screen size with limited bandwidth. A script like Boomerang, which attempts to measure a user’s connection speed, could be very handy in this situation. I was chatting with James about the implications that lazy loading could have for earlier phases of the design process: wireframing, page description diagrams, and so on. Traditionally, you’ve got only two choices when judging what content to include: either something is on the page or it isn’t. You can use hierarchy, position and contrast to emphasise or de-emphasise the content but fundamentally, it’s a binary choice. But with conditional lazy-loading there’s a third option: include some content if the user’s circumstances warrant it. Mobile devices require software development teams to focus on only the most important data and actions in an application. There simply isn’t room in a 320 by 480 pixel screen for extraneous, unnecessary elements. You have to prioritize. So when a team designs mobile first, the end result is an experience focused on the key tasks users want to accomplish without the extraneous detours and general interface debris that litter today’s desktop-accessed Web sites. That’s good user experience and good for business. Sometimes there are political reasons for wanting the “extraneous detours and general interface debris.” Lazy loading for large-screen users could be the least worst option in that situation. Semantically speaking, the kind of content that might be marked up in an aside element might be a good candidate for lazy loading …if the viewport is large enough. 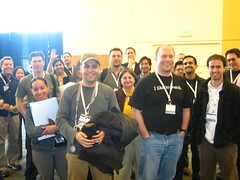 Podcast coverage of South by Southwest Interactive 2007 continues to emerge, drop by drop. The audio recording of my joint presentation with Derek emerged last month. As usual, I’ve had the talk transcribed so you can read it, search it and link to it: Ajax Kung Fu Meets Accessibility Feng Shui. 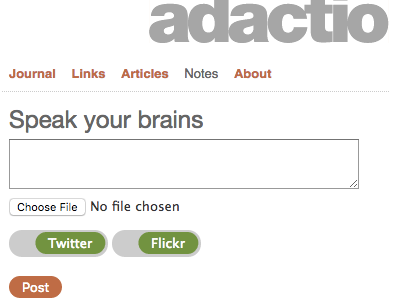 Don’t forget: the RSS feed from the “articles” section of this site doubles up as a podcast. There’s still no sign of the talk I did with Andy, How to Bluff Your Way in Web 2.0 , but as soon as it’s available, I’ll get that transcribed too. When I wrote DOM Scripting , I can’t say it was the most pleasant experience. I found the act of writing to be quite laborious. As anyone who has written a book will tell you, it’s a hell of a lot of work. But then when the book was finished and I finally held it in my hands, I experienced a great feeling of satisfaction. Once the reviews started coming in — mostly more than favourable — I felt even better. Before too long, I had almost forgotten the pain that had gone into writing the thing in the first place. It was while I was in this vulnerable state of the newly-chuffed author at last year’s South By SouthWest that I was wined and dined by a charming representative from New Riders. Before I knew it, I found myself agreeing to write another book, one about Ajax this time. Once the contract was signed, I was back behind my laptop staring at a blank Word document. That’s when I started remembering the pain of writing the first book. Bugger. Fast forward to today. I’m done. 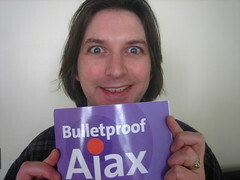 The book is called Bulletproof Ajax and it will be released in one month’s time. As yet, I don’t have a physical copy in my hands but already I’ve got that warm glow of achievement. I’m really, really pleased with how the book has turned out. Now, here’s the thing: I think that people will either love this book or hate it. I didn’t write a typical programming book. Instead, the book has a strong sense of narrative and a distinctive tone of voice. I’m hoping that this will appeal to a lot of people but I expect it’s equally likely that it will put other people off. Personally, I love it… but then I may be a little bit biased—like a parent talking about how special their child is. Oh, by the way, about the title… I have Dan’s blessing. I just thought it was such a great adjective to apply to my approach to Ajax that it fit like a glove. So minus points for originality but plus points for accuracy. Bulletproof Ajax is available to pre-order from Amazon. Some of the details listed on the Amazon page have been plucked from thin air and will get updated soon: the book is closer to 200 pages than 300. If the release date listed on Amazon is correct, then the book will be available just in time for Valentine’s day so you can go ahead and get a book on Ajax for that someone special in your life. XMLHttpRequest is a geek’s best friend.